On the 6th of April the attention of the F1 fans shifts to Interlagos in Brazil as it is here that third race of the current F1 season will be raced. The total length of the circuit is 4.039 km and it would take a full 71 laps before anyone can dream of reaching the checkered flag. Thus the total distance raced would be roughtly 309.91 km. Enough for a few overtaking attempts and in the process a few knock-outs as well. 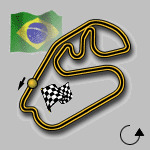 Set in the suburbs of Sao-Paulo this track has the reputation of being highly bumpy for fast F1 racing cars and will be sure to test the reflexes of the drivers this time as well. Things are sure to get worse if the track is wet, not just for the race but individually for the drivers as well. Only time will tell who will take the lead and who the points but for now we can only keep our finders crossed. High reflex would be the thing to get the masters of F1 beyond the finish line. But for us, thankfully, it would be pure thrill. The best flying lap for the pole could be around 1 minute 13 seconds and the fastest you would reach would be around 296 km/hr. And the slowest...well if you stall your car then that would be it. So gear up for the Brazilian Grand Prix. The next F1 GP is at Imola in San Marino but that would be a different tale. Will Schumaker take the podium on the top or will he slip. And most importantly will it be another boring race. Well if Schumaker winning always bores you then the maximun you can do is to forget that a first place exist and cheer for the second. Now that's a sound advice. See you at Interlagos then.